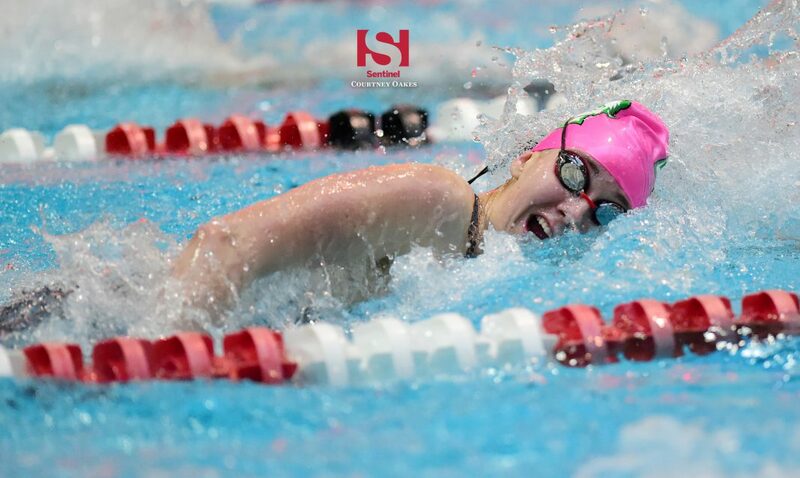 THORNTON | Juniors Maggie Robben and Blythe Iverson made a championship final apiece and helped lead Smoky Hill to a 16th-place finish at the Class 5A girls state swim meet. Coach Scott Cohen saw the benefits of the addition of four more places in each event — a movement he backed strongly — as Iverson and Robben placed 10th in the 500 yard freestyle and 100 yard breaststroke, respectively, to help the Buffaloes accrue 63 points ( (full team scores, championship and consolation finals results, here). Robben also placed 12th in the 200 yard individual medley and combined with fellow juniors Kristina Domashevich and Katie Power and Annelise Thomas on the placing 200 yard medley relay (14th) and 400 yard freestyle relay (15th). Senior diver Jaclyn Santiago chipped into the cause with her 19th-place finish. Robben continued an upward trend at the end of the season, as her times in the prelims better her seed times and her finals times bettered her prelims times in both events. She clocked a time of 1 minute, 5.41 seconds in the breaststroke (down from 1:05.52 pre-meet) and finished in 2:07.83 in the 200 IM (down from 2:09.19 pre-meet). Iverson dropped six seconds from her seed time in the 500 freestyle in the prelims (5:12.96) to rise from the 19th seed coming in and grab the last spot in the championship final, while her final time rose to 5:19.77. She swam 2.60 seconds faster than her seed time in the 200 freestyle as well, but finished 26th and six spots outside a berth in the consolation finals. The 400 freestyle relay improved its pre-meet time by more than two seconds when it finished in 3:39.61, while the 200 medley swam almost the same time (1:50.80) in the consolation final as it had pre-meet (1:50.73).